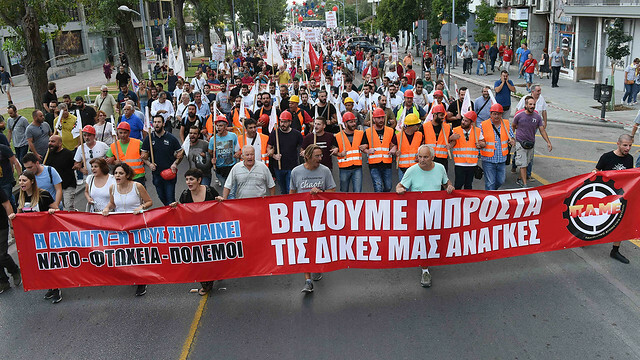 Thousands of workers, unemployed, self-employed, farmers, women and young people participated in the massive demonstration on Saturday afternoon (8/9/18), organized by the All Workers Militant Front (PAME) in Thessaloniki, demonstrating under the slogan "Their development means NATO - Poverty - Wars. We put forward our own needs". With slogans, events, placards, in the mass rally at Aristotle Square and then marching behind their banners, the protesters militantly responded to the intensification of exploitation, the government mockery of "exiting from memoranda" and "recovering rights", while the anti-people attack escalates and the country's involvement in US-NATO plans deepens, with enormous dangers for the people. They clarified that the solution is not disappointment, fatalism and the expectation of a "pro-people" government, but the uncompromising class, militant, mass struggle, through the trade unions, with organized struggle in the workplaces, against the government - NATO - EU, with the weakening of the employer led - governmental trade unionism, with a struggle that militantly focuses on contemporary workers'-popular needs. With their massive participation, thousands of demonstrators from Thessaloniki and the surrounding regions demonstrated against the police-state, the climate of intimidation and provocation that had been cultivated during the previous days from various sides. "Today we are demonstrating under the banners of PAME, here in Thessaloniki, in a police – US controlled state, for the satisfactions of the needs of the people today. During the past eight years, the governments of ND, PASOK, SYRIZA have brought us to working conditions of the Middle Ages. Mr Tsipras' next day will be no different from the previous one. Because, as it seems, the memorandum laws and anti-people laws will exist, our people will suffer under poverty and unemployment, US-NATO plans will be made in the region, to which the government has given land and water all these years. And, of course, the Greek people are looking ahead. We all must look ahead. With a strong KKE, with a strong labor movement, with a social alliance, we can bring the necessary overthrows and radical changes, with the people truly in power, for a new society, a new economy". Now, after the successful rally of PAME in the Thessaloniki International Fair, the baton of the militant mobilizations passes to the demonstrations being organized by trade unions and organizations in Attica on Thursday, September 13, in Athens, Piraeus and Eastern Attica.